• Although you love carbs, you have to avoid eating some of your favourite foods to prevent weight gain. • Relax your strict diet. Use SONTAL StarchLite® to reduce the impact of calories. • You can eat more of your favourite foods without feeling guilty. • The caloric impact of sugars resulting from starch digestion is reduced. • Conversion of sugars coming from starch into fat is lessened. • Weight gain from starch in meal is limited. Extract from natural white kidney bean. Reduces the breakdown of starches. Reduces the enzymatic breakdown of starches. StarchLite® is an all-natural extract of white bean (Phaseolus Vulgaris) which has properties of decreasing the digestion and absorption of carbohydrates. 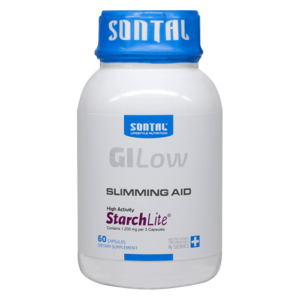 StarchLite® is a natural product already used all over the world by numerous consumers wanting to adopt a low-GI diet (reduction of GI), to control their glycemia (reduction of glucose impact) or to manage their weight (reduction of caloric impact). StarchLite® is one of the few ingredients that have received claim authorizations. It benefits from 2 US health claim authorizations validated by the FDA (Food and Drug Administration). Clinical studies really assessed StarchLite® safety and efficacy. StarchLite® is easy to use, either as in food or in functional food. When choosing StarchLite®, you embrace a breakthrough innovation. Directions for use: Take 3 (three) capsules before a starch rich meal.